A buzzer can produce a chirping noise if you charge a capacitor and then allow the capacitor to discharge into the buzzer. Because the voltage of the capacitor becomes less and less as time elapses when it discharges, it feeds different voltages into the buzzer. The differing voltage levels produce different pitches from the buzzer, so it's as if the buzzer gives off a brief chirping sound which fades out very quickly. When you push the first pushbutton down, pushbutton 1, you charge the capacitor. After you've held it down for just a few seconds, the capacitor will be fully charged to the 9 volts that the power supply supplies it. Now release pushbutton 1 and now push down pushbutton 2. When you push down the pushbutton, the charged capacitor now releases its voltage into the buzzer. If you know capacitors, they give out full voltage at first but as time elapses, they give out less and less voltage. 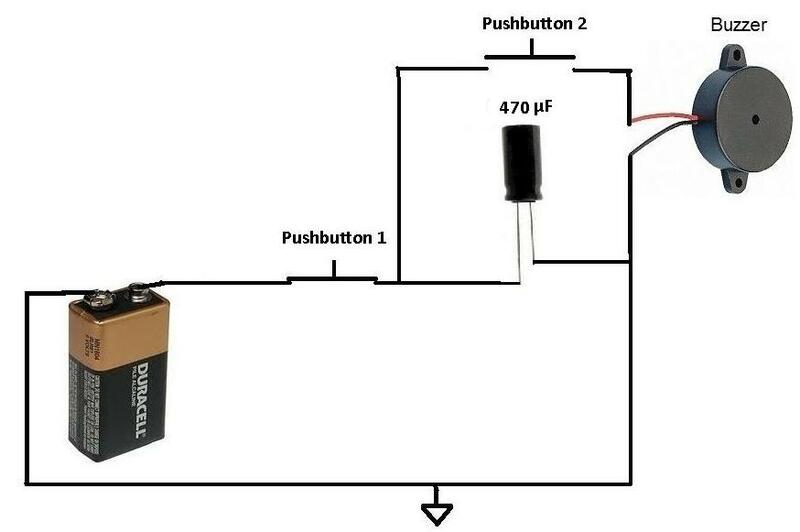 As the capacitor gives out less voltage, the pitch that the buzzer produces corresponds according to the differing voltage levels. Thus, it's as if the buzzer emits a brief chirping sound. So this is how this circuits works.